Starting in 1952 and allegedly concluding in 1970, the Central Intelligence Agency undertook a highly-secretive project to develop a dart gun which could administer super-secret poisons or biological and biochemical agents, as reported by the New York Times in 1975. 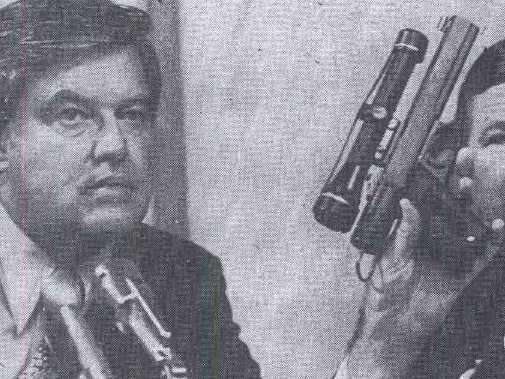 Former CIA Director William Colby told the US Congress that the agency's dart gun, or "nondiscernible microbioinoculator," was electrically-powered but fashioned after the Army's Colt semi-automatic pistol. Unlike the Army's pistols, however, the CIA's dart gun was not meant to be used openly against combatants on the field of battle, but rather in crowded cities, under the cloak of secrecy, and against non-combatants. There are reports that CIA agents involved in Project MK-NAOMI trained in using their dart guns in the New York City subway during rush hour, with commuters remaining completely unaware that an assassin was training in their midst. Not only did the CIA use American citizens as shooting targets, the agency flooded the New York City subway with "a harmless stimulant of disease-carrying gas." According to the New York Times, the CIA was stockpiling and using these toxins even as President Richard Nixon ordered against it, showing that the agency considered itself not to be just above the law, but also the White House itself. The Times went on to further detail that the CIA bioweapons stockpile developed as part of Project MK-NAOMI included agents which could induce tuberculosis, encephalitis, smallpox, "food poisoning that appeared to be botulism," and a diabolical list of other horrifying killers from the Middle Ages. In 2010, United Nations forces were alleged to have accidentally dispersed cholera in Haiti, with CNN and other major news organizations calling on the international body to "take responsibility" for the deadly epidemic ravaging the collapsed state. The United Nations denied involvement and has refused to compensate victims, setting a terrifying precedent for the mass dispersal of biological agents on the American continent. Since the 1970s, carrying out experiments on US soil and with US nationals has become more legally problematic, but no such problematic restrictions exists on foreign soil, in a country without a military or stable government. Recent revelations about the weaponization of cholera have stoked suspicion in Dominican radio the CIA is using the Haitian population as guinea pigs in the same way that the people of New York City were used. The United States was behind the coup which took down the democratically-elected government of Bertrand Aristide, and Washington was so adamant about maintaining a strong presence in Haiti that it politely requested that the general in charge of the United Nations peacekeeping force use more bullets to subdue dissidents opposed to the removal of Mr. Aristide. The CIA is probably not experimenting with its dart gun anymore, which in the 1970s had an effective kill-range of 100 meters [330ft.] There are reports that the agency has developed a dart rifle capable of nondiscernibly microbioinoculating from exponentially longer distances, and which has been used extensively to kill covertly as part of the War on Terror.